There are many cricket contests by various establishments and much emphasis is laid on school cricket. The schoolboy cricketers who undoubtedly are the future Test players for the country, and having hit the top, they are on the brink of getting selected to the national side. Any schoolboy cricketer’s dream is to represent the country at the highest level and this show which has been existing over three decades has served the purpose of so many youngsters to achieve their ultimate goal. These were the sentiments of M.T.A. Rauff the Secretary of the Sri Lanka Schools Cricket Association with regards to the Sunday Observer/ Mobitel Schoolboy Cricketer of the Year Show. So many experts have aired their views, time and again of the Sunday Observer/Mobitel Schoolboy Cricketer Of The Year show and I like to join them and tell one and all that it a show never to be missed. Millions have been spent and Sunday Observer and Mobitel have combined very effectively to make this show a great success. It is a much looked forward to event by the schoolboy cricketers in this country. The link between the Sunday Observer and the Sri Lanka School Cricket Association along with the sponsors have something unique when it comes to the development of the game in the country. This combination has helped the young immensely, not only where cricket is concerned, but in their day to day life. Observer/Mobitel Schoolboy Cricketer show. The Sunday Observer Schoolboy Cricketer of the Year is a trusted and proven show as almost 90% of the winners of either the main award or sectional awards have gone to represent the country at the highest level. It is a big boon to any aspiring cricketer. These sentiments were expressed by former Sri Lanka Test cricketer Naveed Nawaz who won the award in 1993. Former Sri Lanka cricketer Jayantha Seneviratne was full of praise for the Sunday Observer/Mobitel Schoolboy Cricketer Show. The contest has spanned over three decades and thereby given young school talent all the encouragement it needs to go forward. Observer/Mobitel Schoolboy Cricketer of the year competition gathered momentum from early days and is now a well-established competition. In 1985, Shane Fernando was the Outstation Schoolboy cricketer who former Sri Lanka “one drop” bat Asanka Gurusinha now domiciled in Australia, became the Schoolboy Cricketer of the Year (All Island). 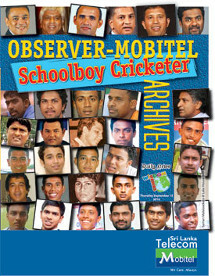 Observer-Mobitel Selections: After a lot of deliberation, a panel of twelve officials connected to the school cricket fraternity, selected the award winners at the Sunday Observer/Mobitel Schoolboy Cricketer of The Year 2011 final selection. Observer/Mobitel Schoolboy Cricketer: Kumara Dharmasena, the 1989 Observer Schoolboy Cricketer of the Year has been a prominent figure in the contest during his school going days at Nalanda College. He, not only became the 1989 Schoolboy Cricketer of the Year, he was also the runner-up for the main award the previous year (1988) that was not all.